The TI5400a 400Hz GPU-24 UAV ACDC offers tremendous flexibility to power or start any 24 volt vehicle or aircraft, provide reliable 50/60 Hz or 400 Hz ground power and filtered 400 Hz power for an aircraft. All this plus, a Pure Sine Wave Inverter with a 60 Hz 120 VAC outlet. 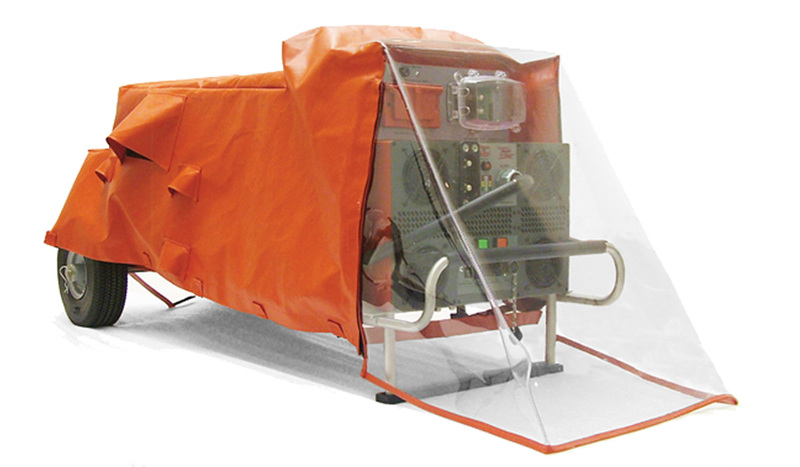 Operates and charges from either three phase 200-260 VAC 50/60 Hz or three-phase 200 Y 115 VAC 400 Hz. 120 Vac 60 Hz Pure Sine Wave <3% THD. The Tesla™ TI5400 400Hz GPU UAV ACDC is expertly engineered as a single source of power for the Global Hawk UAV and other UAV systems. 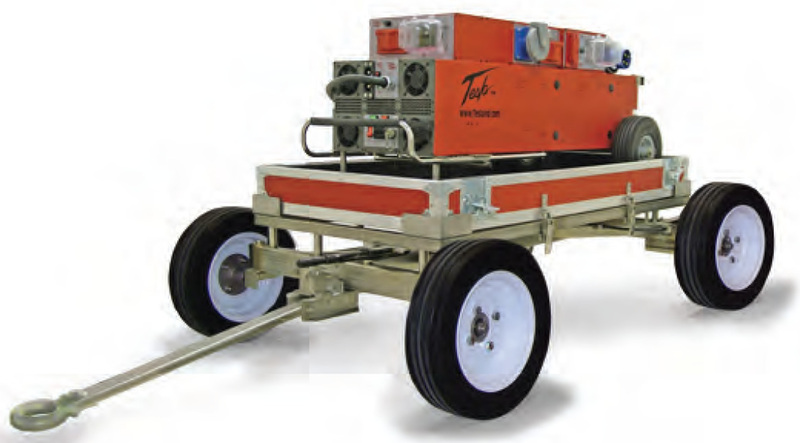 Using a 30kVA 3-phase 400 Hz generator, the TI5400 400Hz GPU UAV ACDC provides reliable ground power and filtered 400 Hz power for UAV aircraft. Additionally, a Pure Sine Wave Inverter with a 60 Hz 120 Vac outlet allows you to conveniently plug in laptops, cell phone chargers, and other electronic equipment. 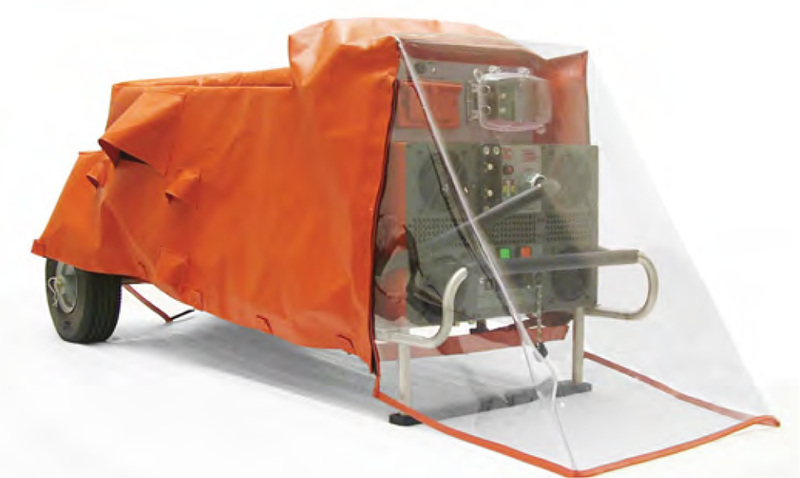 The TI5400 400Hz GPU UAV ACDC comes equipped with a 3-phase 200Y/115 Vac 400 Hz Input under a weatherproof cover. 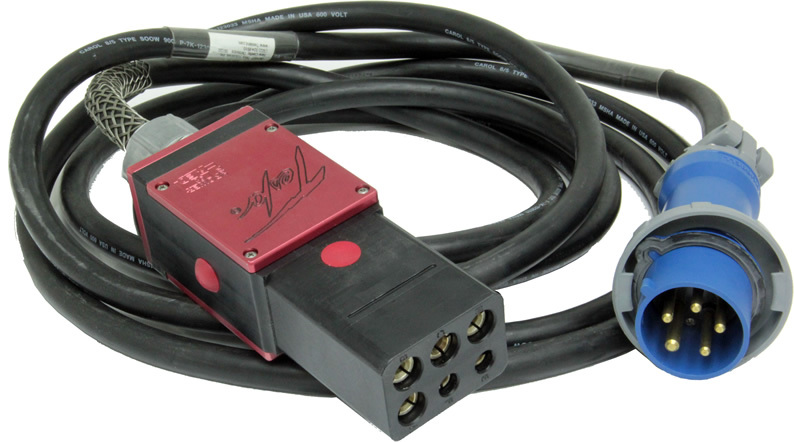 This input receives a 400 Hz cable assembly that will connect to any standard 3-phase 200Y/115 Vac 400 Hz receptacle. 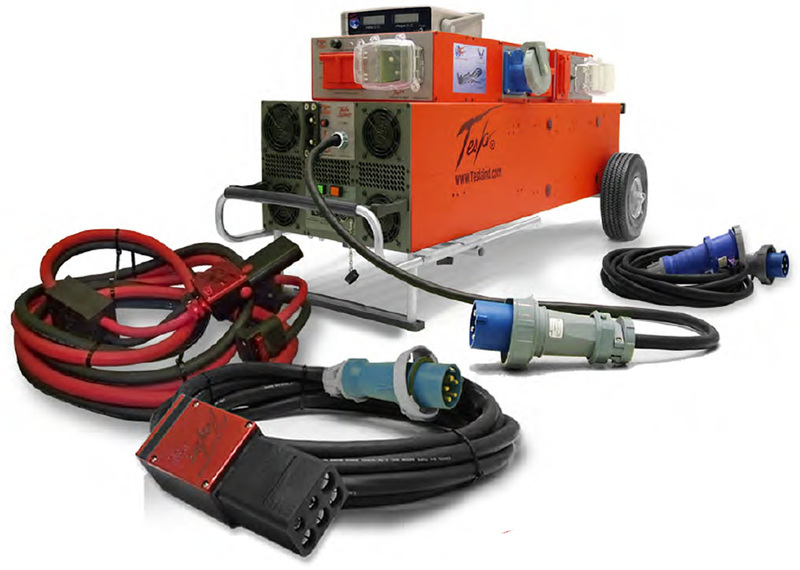 The 400 Hz 208Y/120 Vac Output provides filtered 400 Hz 208Y/120 Vac at 30 amps for powering aircraft systems. Connected directly to the 400 Hz ac input, the filter eliminates potentially harmful surges and high frequency noise and harmonics. Another standard feature is the 1,800 Watt ac uninterruptible pure sine wave inverter with 60 Hz 120V power outlet. The outlet makes it convenient to plug in laptops, test instruments, cell phone chargers, and other electronic devices without using an alternate power source. The dc output receptacle is an aviation battery style receptacle and will provide regulated 30.25 Vdc at up to 400 amps when the unit is plugged into 3-phase power. Up to 3000 peak amps are available from the internal cells. The built-in Charge Status Meter (via the "Push to Test" button) serves as a recharge state indicator for the dc output. 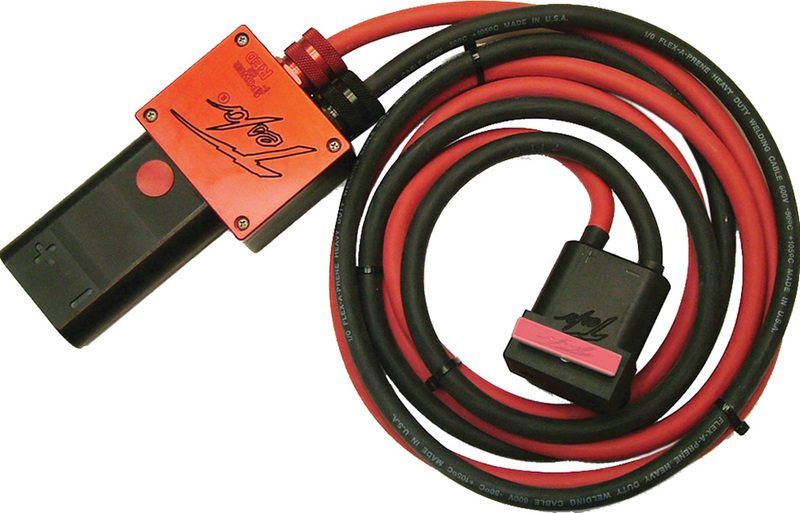 The Tesla™ Digital Volt / Amp Meter is a high powered measuring solution. 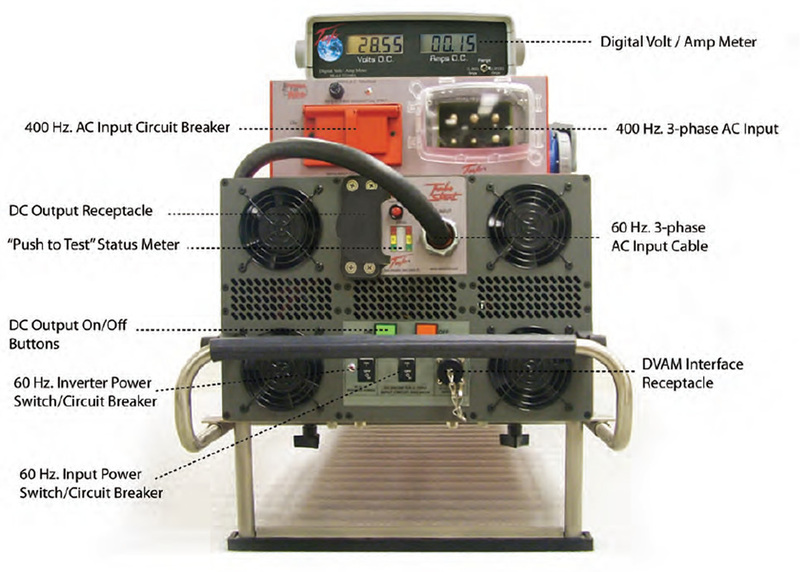 The TI3100A DVAM provides measurements for dc voltage from 0 to 200 volts or amp draws between 0 to 2000 amps, with a flip of a switch, for Aircraft and vehicle. Integrated with the Tesla™ Turbo Start™ GPU power supply, DVAM is a valuable tool for troubleshooting and conducting systems checks. 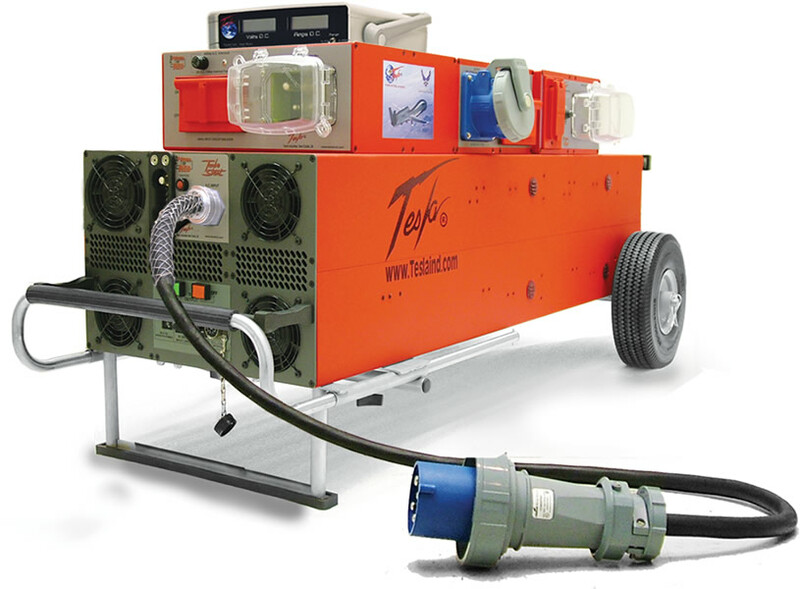 10.4 kVA 30 amp 200Y/115 Vac 400 Hz ac filtering produces "clean" power to test avionics and weapons systems. TI2007-024 17’ 350MCM Cable has voltage drop of less than 500 mV @ 400 amps maintains > 28 V at the end of the dc NATO output cable at full power. 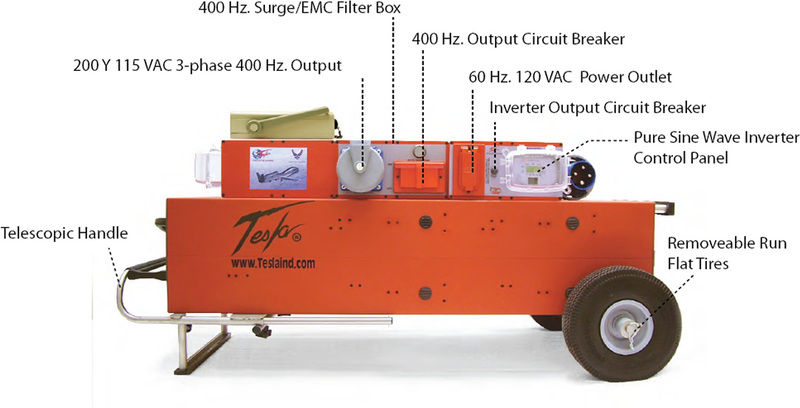 20 us transient response time from 0 amps to full power (400 amps) with less than 2.5 volts of undershoot. 20 us transient response time from full power (400 amps) to 0 amps with less than 2.5 volts of overshoot. Meets or exceeds Global Hawk aircraft system requirements.